This Sunday is Mother's Day, in case you didn't know. I wanted to share something special that you could make for your mama and show her just how special she is. Of course, these are so adorable and delicious they deserve to be made more than once a year. 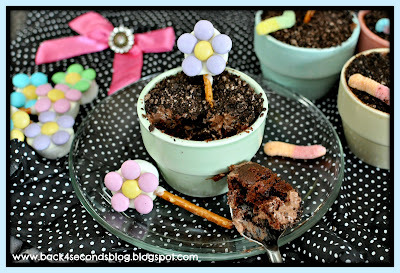 I think the fact that it's spring is reason enough to make these sweet little flower pot cakes. Who could resist an individual flower pot filled with rich chocolate cake, cream cheese pudding, oreo "dirt", and an edible flower?? Not me. Yummy desserts that are also cute are hard to say no to! These are super cute! I never thought of baking cake for these. I've seen them done with ice cream before, but I love your idea. Thanks for sharing! Love from Whimsically Homemade. 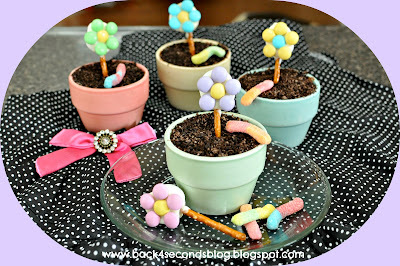 I used to make cake dirt for my kids but I never though to use a a little clay pot:) Great idea! Just visiting from My Crowded Kitchen and am now following you. I would love for you to link this adorable post on my first ever blog hop. I so hope to see you there. So adorable! and they look so delicious! These are tooo cute! 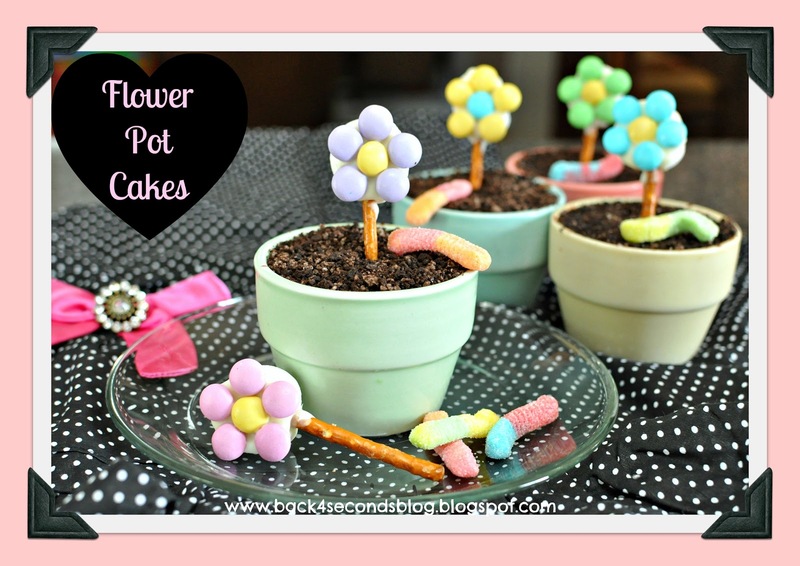 I love the idea of putting cake in a flower pot! Such a cute way to present it! How cute is that!!!! Love it! Did you find those clay pots in those fun spriny colors? OK I thought the flowers were cute on their own but now in the pots? Too too adorable! These are very cute and adorable !! SO ADORABLE. I wish I was a mom if only for the reason that I would want someone to make me these. They're too cute! And Oreo cream cheese pudding? OMG. How cute. Thanks for sharing this with us @ the Sunday Round Up. Oh gosh, they look just too cute! Adorable! Would love for you to link up to the Pomp Party! I adore this idea! So much fun & so cute! Would be so fun for kids to help out too! Thank you for sharing your fantastic idea at Sunday Round Up! Have a great week! Oh my goodness! These are adorable!!! What a great dessert for a spring tea!!! I will certainly make these! These are so stinking cute! They look delicious! These are adorable. I do not have a green thumb :) but even I could manage to make flowers this sweet! Just wanted to let you know I featured this as part of my link party wrap up! Very cool! I used to make 'dirt' with gummi worms in it which I would stick an artificial plant into. Been a long time! Awww these are BEAUTIFUL!!!!! What a cute idea, just adorable! Oh, my. These are the cutest cupcakes I've ever seen! These are so cute! I think the Cream Cheese Oreo Pudding sounds really good. I am always looking for pudding recipes without milk. Thanks for sharing at Showcase Your Talent Thursday! Would love for you to share with my readers at my linky party (stringtownhome.blogspot.com)! I thought the flowers were cute...but these are adorable! Thanks for joining Southern Sundays with this wonderful recipe! Hope to see you at the next party with another great item! How adorable. Very creative. Come and visit us. We have some wonderful things this week to share. These are too cute! I may try these for my little girl's birthday party in a few months! These are so darn cute. Thanks for sharing at Bacon Time. 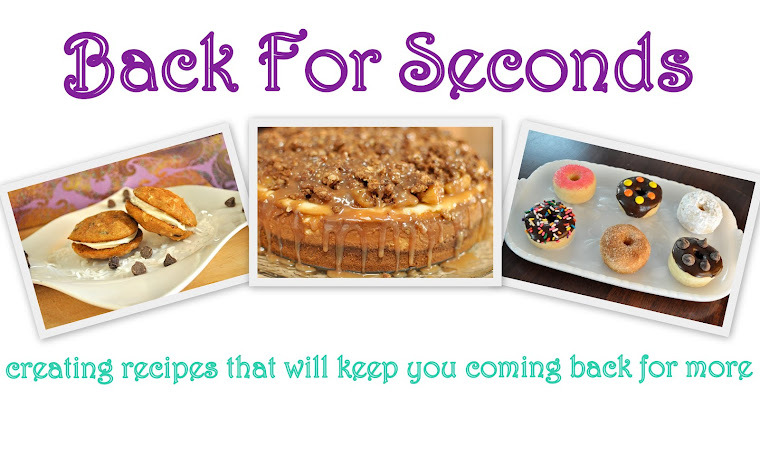 Thank you so much for linking this lovely recipe to my blog hop! Those are too cute for words and would be darling for a little girl's birthday party. Every detail is absolutely adorable! I love the colorful pots and the edible flowers -- making the classic flower pot cake totally new and all your own. Fabulous!